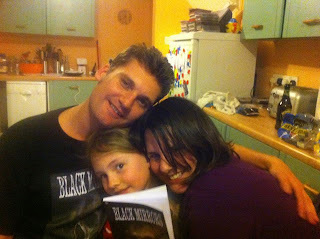 THE SATANIC MILL: Black Mirrors arrives! I've received an advanced copy of Black Mirrors and very nice it looks too. Had a great night - Mandy got in the whisky and my brother Dan popped round to help drink it! As you can probably tell, I'd had a few by the time this picture was taken! My daughter Lily joined us having been woken up by our rowdy celebrations. A great night, and very proud to see my first book in print.